Suddenly….I’m on a stage in front of a crowd of Nova Scotians, guitar in hand, strumming an A7 chord. I inhale deeply, knowing that breath must sustain me to sing the next 84 syllables. Here goes nothing! Let me back up just a step in case you entered this journey sometime in the middle. Hank Snow was the first person to sing the Americas version of the song “I’ve Been Everywhere.” I’m having a hard time choosing a word to describe his life story. Incredible is not an understatement. How a diminutive, sickly child; a victim of abuse raised in the far east of the continent goes on to be a world famous country western singer I will never fully understand. As I referenced in my last post, I didn’t need to come here. No place in Nova Scotia is among the 92. But for some reason, it seemed important. Had Hank not decided to sing this song in 1962, there is no way my trip would exist. The museum grounds were already buzzing, despite the event not officially beginning until noon. 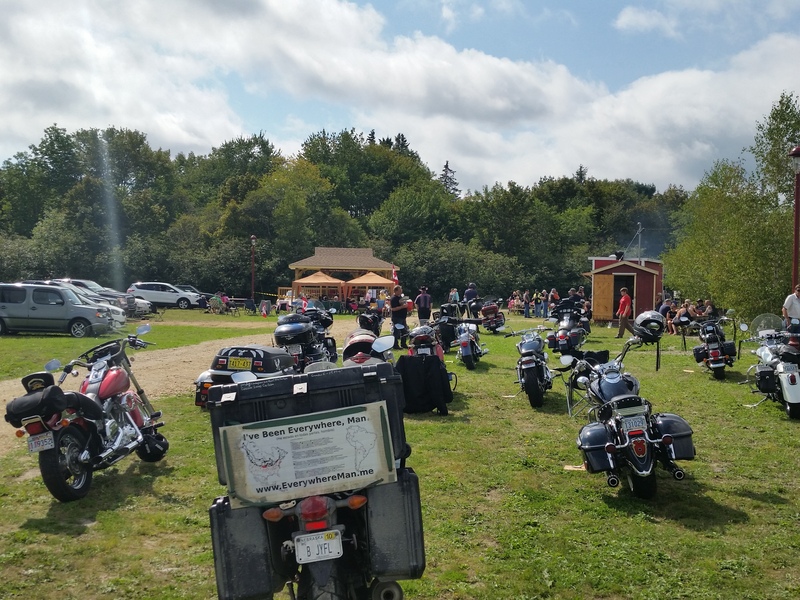 This was the first Gaven Whynot Memorial Motorcycle Show & Shine. Gaven was a supporter of the museum and an avid rider. He had always wanted to host a motorcycle event. Sadly, he passed away about a year ago, but this event was a great way to honor his memory. The beauty pageant is just getting underway. First up is the evening gown competition. One by one the contestants stride gracefully across the stage, hair neatly coiffed, secured with copious amounts of hairspray; skin glowing evenly, each blemish concealed beneath layers of foundation. Their appearances are no accident, they’ve been physically preparing for this day for years. They know that a single extraneous eyebrow hair can be the difference between victory and defeat. The crowd claps politely as one by one the ladies file across the stage. Pageants cannot be won in the beauty gown competition, but they can be lost. Attempting to stand out in this phase is a reckless decision. A strange sense of deja vu fills the room, as the ladies nearly match each other identically; stride for stride and smile for smile. Until Ms. Nebraska shows up. The crowd gasps, falling silent for a few moments. Then murmurs crescendo throughout the hall as this woman of the plains becomes fully illuminated by the harsh spotlights. Ms. Nebraska had planned a workout to quell some of the pre-pageant nerves. An unexpected downpour had turned her trail run into a slow muddy slog. She had just made it back in time for her turn on the stage. There was no time to change. No time to shower. But also, she felt, this was no time to hide. She was determined to have her moment. Droplets still falling off of her pony tail, she charts her course for center stage. Clad in sports shorts, a tank top and haphazard layers of mire, she is the antithesis of the other contestants. She holds her chin so high that she does not see the “X” of tape on which she was instructed to stop. Instead she strides right to the edge of the stage before stopping for the judges. Her smile shows no teeth, unlike the myriad of other competitors. Hers is an impish, asymmetrical smirk, displayed while planting her right palm defiantly on her hip. The crowd now falls silent again, as her gaze seems to pierce each one of them. Time stands still for a moment. Finally, almost mercifully, she turns and makes her way off of the stage, the muddy prints of her sneakers showing each firm step of her path. Ms. Nebraska was not going to win any awards tonight, but she was going to be the topic of a few conversations. …..Sorry that got a little weirder than I thought it would. So Annie wasn’t going to win anything, but I hoped her inclusion at least provided some interest. I was welcomed warmly by so many people. Among them, Kelly, the Manager of the museum, with whom I had corresponded via email before my arrival; Charlotte, the Director of the Friends of Hank Snow Society (I think we might now be best friends); and dozens more people whose names I wish I could remember. There were lots of bikers around (none of them smelling worse than me) so there was some natural interest in my story. It was nice to be in a place where I didn’t have to begin my explanation of my trip with an explanation of the song. They all knew it. One of my favorite stories was from a guy who is a big college football fan. On a cross country ride, he made a detour into Nebraska just to pick up a Husker jersey. It is still in his closet. He calls it his $5,000 jersey since that was the total cost of the trip. I offered him my Nebraska hat for the same price, but no transaction took place. Good food, good music, good stories, lots of signatures all over Annie. I was so glad that I had made the detour. But then someone made the comment, “I’m always so impressed whenever anyone can get up and sing that whole song!” Some big-mouthed Nebraskan (not saying any names) among the gathered throng blurted out, “Oh, I can sing it all.” There was a follow up question about guitar playing ability and before I knew it I had a manager (of sorts) beseeching the MC on my behalf to let me get on stage and sing the song of my trip. When this trip began, I did not have the song memorized. Verses 1 and 2 were solid, 3 was OK and 4 was sloppy. I learned it on the road. When I had my time back in Nebraska I must have played through it a couple times, because I had in my mind that the key of A was the right one for me. I am by no means an expert at singing and playing this song together. I talked to the MC (I think his name was Louie…that’s what I’m going to go with. Please someone correct me if I’m wrong. There were a lot of names that day.). He didn’t know if there was a guitar around for me to practice with, but he said he would go home and bring his. That was a relief! With Louie’s guitar I withdrew myself from the festivities, into some woods around the grounds. I tuned up and attempted a run through. This is not good. Why did I agree to this! “I’ve Been Everywhere” might just be the toughest song I know. Not the lyrics, surprisingly. I had no concern about remembering the 92 places in order. The difficulty comes from breath control/tempo control. These two facets go hand in hand. A single breath needs to last the entirety of a verse and the first line of the chorus (the 84 syllables referenced earlier). Choose a tempo too slow and you will not make it. Choose a tempo too fast and you will not be able to pronounce everything. In Hank Snow’s live versions (above), he puts his guitar down and I know exactly what he’s doing: He’s focusing completely on his breathing, sometimes sneaking half of one early in the chorus. He sings it really well. Funny enough, Hank was actually disqualified from service in the Canadian military during WWII due to a lung deformity. The Johnny Cash studio version is at quite a slow tempo. Very few, if any, people could make a breath last a whole verse. Johnny’s voice is spliced together from multiple takes. I’m not calling him a cheater, that’s how most vocal tracks are recorded these days. Two things were preventing me from finding this delicate tempo/breath balance. First, I think I’ve lost some lung capacity. I’m in the worst shape of my life (aerobically speaking) in over a decade. Second, I have no speed in my right hand. I simply could not strum fast enough so that a breath would last long enough. But each runthrough got a little better. I was finding some right hand techniques to mitigate my lack of speed. Unfortunately, I couldn’t practice too long since my left fingers were already throbbing. I’ve lost my calloses! What should I do? Should I do the honorable thing and withdraw, so as to not besmirch this wonderful song? Should I proceed courageously and make questionable attempt? I let one hypothetical question make my decision for me: What would Hank Snow do? I decided to give it a shot. The lady who sang before me was awesome (she can be seen adjusting my mic in the first video, I forgot her name!). She sang a ton of songs in a wide variety of styles. I awaited my turn with a surprising amount of nerves. I was to be the final attraction (repulsion?) of the afternoon. Once the awards and raffles were completed, I was invited on stage. There were some issues with the first guitar I had so I switched to an even more unfamiliar one. It appeared to have six strings so I thought I could play it. Here goes nothing! Ok. You know I like to analyze. Let’s break this down. Intro: Just fine. A few pitch issues as I get used to listening to myself in the monitors. First chorus: I absolutely nailed the tempo I needed. If I could have maintained this throughout the whole song I would have been fine. Verse 1 “Reno”: OK. Tempo was good. After the following chorus I kind of forgot the words for Verse 2. As I sturmmed and thought my tempo dropped. I had lost lots of steam. Verse 2 “Boston”: Hold on! My breath barely makes it due to my slower tempo. You can hear a throaty inhale as soon as I get to the chorus. I really dodged a bullet. Verse 3 “Louisville”: So how can I speed myself up with my right hand endurance fading? I played just the backbeats on guitar during the verse. This made my rapid acceleration less noticible. I think this was pretty clever actually. Verse 4 “Pittsburgh”: End in sight, I go into stop time. This whole section gets pretty shouty and I begin to sturuggle with pitch. I plan a stop at the end of the verse and then butcher the pronunciation of “Cedar City” (sorry Utah). I continue to stumble my way through and eventually fall across the finish line. Some songs you sing. This song, you just survive. It definitely could have been worse though. The performance was one of my best run throughs. Given time and training, I think I could play/sing it quite well. People very kind and complimentary with their comments. I met some wonderful people. Ooof this is long. I better stop there. Next post will be “…..and Fortune.” As always, thank you for reading/listening. Realtime update: Sitting in Waterville, ME, place #27. Waiting for things to open up. 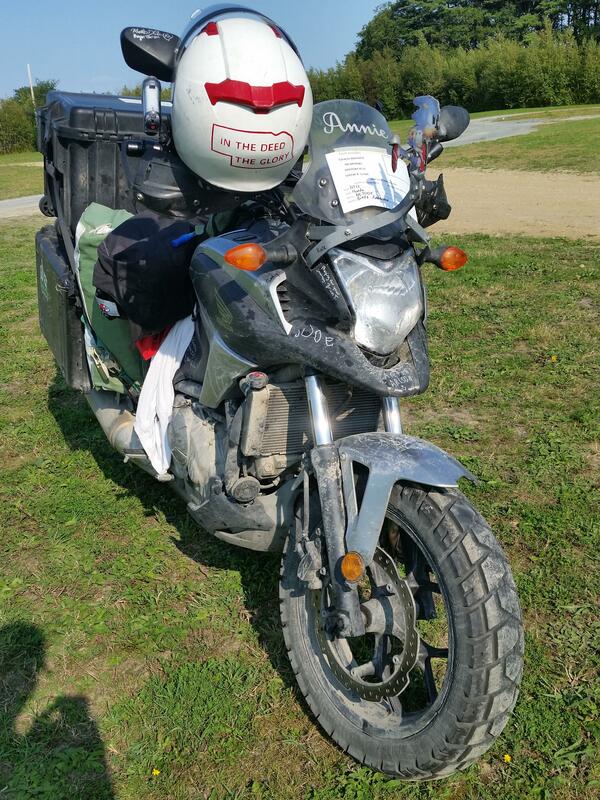 My rear tire is getting quite bald, but I only have a couple hundred miles to go on it. Wow! I’m so impressed! Loved hearing you sing The Song! Great job!!! WOW! Great performance! You are putting Nebraska on the map! Great performance! Loved it and all your posts! You are really an ambassador for Nebraska! Stay safe! Thanks, Jeanne! I love talking about my home state. I may be the only Nebraskan these people ever meet! Love your talent. … made us proud! I initially typed “running shorts” and then changed it, thinking of you. Sweet moves! Thank you. Hopefully I can improve a little next time! Brett, we did not know u cud sing. Great job..
And the jury is still out. 🙂 Ha! Thank you. Loved hearing you do the song!! Nice guitar work, great singing, and impressive breathing!! Thank you. I’m still recovering I think. Oh the journey would not be complete without a Brett rendition. Well done! The guy that’s goin’ everywhere performs Hank Snow’s song in his home town. What a nice tribute to the man, Brett. I hope he would be proud. He would know how difficult it is to sing and play it at the same time. Few do. Thanks!